Whether you're adding a background image of the venue's floor plan, an image of the beautiful lounge you designed or even your company logo, use the "add image" option, which you can find in the Draw Menu towards the top left of Aisle Planner's Layout Tool to upload your image. Select the Image option from the drop down menu - you'll be prompted to select an image from your computer's desktop to upload. You can upload .jpg, .png or .pdf files to your layout. 3. Once you've uploaded your image, you can click to select that image to move it around on your layout. You can also adjust the size by selecting the image, and using the corner points to adjust the size. 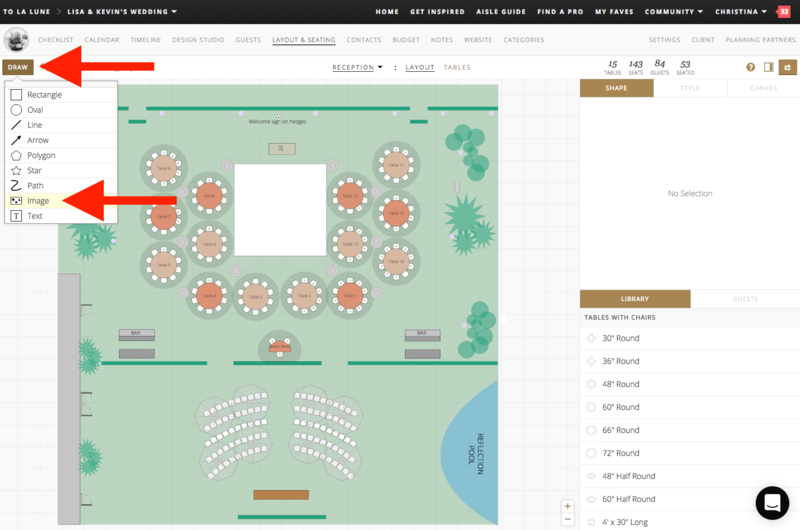 PRO TIP: If you've uploaded any image, such as the venue's diagram, be sure to set the scale for your image to ensure you're designing to scale. Learn more about setting the scale for your uploaded floor plan here.